Originally built in 1385, Bodiam Castle has spent centuries as one of the best loved and best known castles in England. Perhaps it is the design of the building, with an iconic moat and beautiful lush green scenery, or simply the amazing history of the building, which makes it so popular? The castle was built by Sir Edward Dalyngrigge, who is known to have once been a knight of Edward III. With his knowledge of battles, he designed the castle with the intention of defending the beautiful area of Easts Sussex, from a possible invasion by the French, during The Hundred Years Wars. Sir Edward Dalyngrigge was the youngest son within his family and this meant that he was the last in line to inherit anything from the estate. However, he married into a family that owned land, and it was during 1378 that he found himself owning the manor of Bodiam. 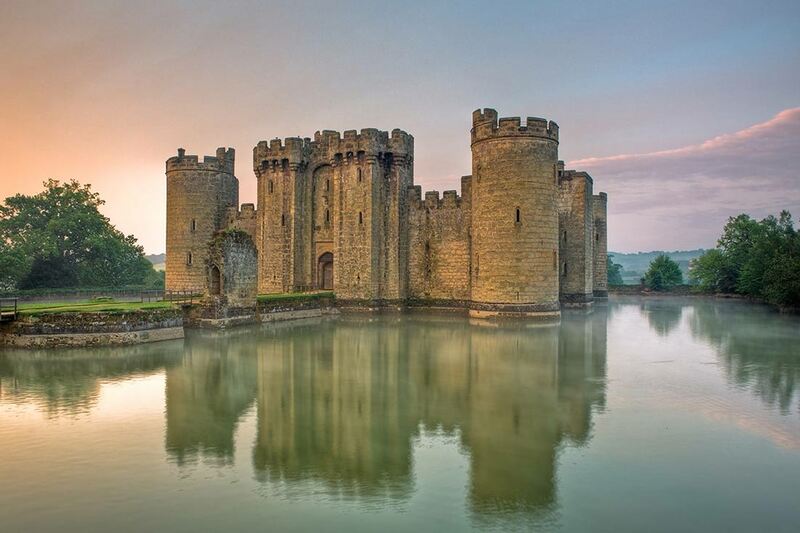 During is knighthood, which spanned from 1379 to 1388 he found himself with enough money to build himself a home, which was the beginnings of Bodiam Castle. Originally, Sir Edward decided to build himself a manor home, a place that was stately and impressive and was even home to weekly market and annual fair, held in the grounds. It was 2 years later, when the people of England found themselves in a state of panic due to fleets of ship, that Sir Edward was allowed to take the steps towards fortifying his manor home and protecting his estate and his family. Rather than using the building that he already called home, Sir Edward decided that he wanted to build an entirely new building instead. This was Bodiam Castle. It became a large project, with the entire castle being built at the same time. This meant that the entire design and style of the castle is the same, which is not something that you often see in other examples. At the same time as the castle was built, the gardens were landscaped and they featured a variety of different waterways around them. 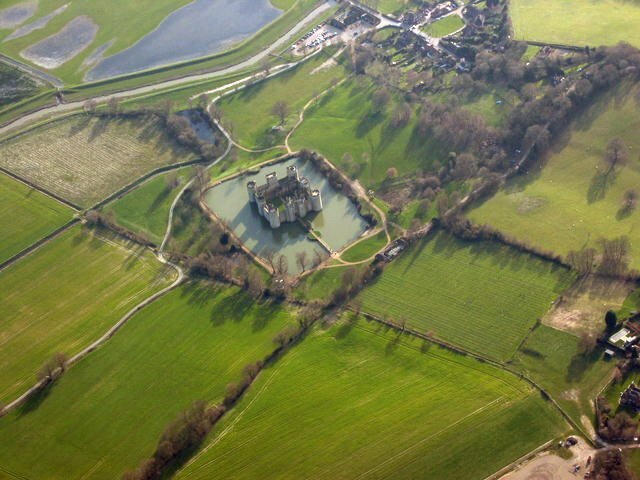 Not only was Bodiam Castle built to protect its inhabitants, but it was also made to be an inviting home too. The design of the castle is something that still intrigues people in this modern time. It is a quadrangular design and features chambers on the outer walls as well as towers on each of the entrance points and the corners. These towers were important as lookouts for any potential attacks that would require a quick response. It also features inner courts, which allowed for space for those living and working within the castle. One of the most attractive parts of the castle had to be the moat, however, whilst this moat looked beautiful, it acted as a sewage system for some 30 different toilets that were found throughout the castle, perhaps not smelling as great as it looked! 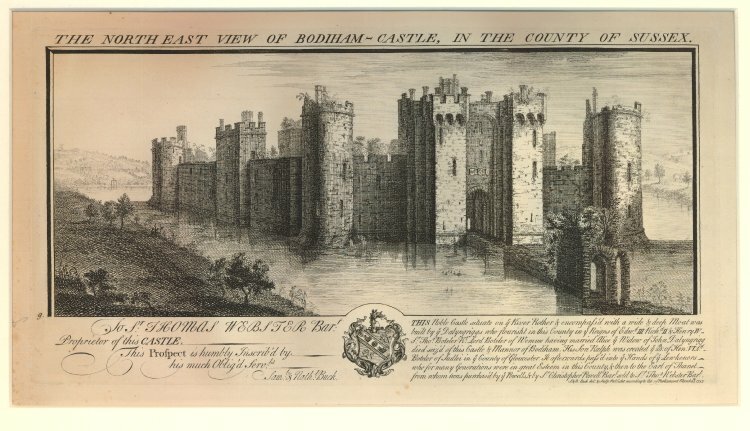 Bodiam Castle was passed down through the Dalyngrigges family, until the line became extinct at there was no-one else from the family alive to live there. This is when it changed hands (via marriage) to the Lewknor family. Whilst it was taken away from them during the War of Roses, 2 years later it was returned to the family, who owned the castle until the 16th Century. During the start of the English Civil War in 1641, the castle was owned by Lord Thanet, a descendant of the Lewknor family. He was a keen supporter of the cause of the Royalists, and he took the decision to sell the castle in order to pay for fines that were brought against him by the Parliament. The castle was bought and dismantled, being left in ruin (albeit a beautiful ruin) until it was purchased in 1829 by John Fuller. John Fuller took on the project to restore the castle partially, until it was sold to George Cubitt and then to Lord Curzon, both of which decided to further the restoration work and try to create a testament to the former glory of this fascinating building. The castle became a Grade I listed building and has been owned by The National Trust since 1925, donated to them by Lord Curzon on his death bed, with the decision taken to open up the ruins to the public. As Bodiam Castle was built to protect the South Coast from the French, it come as no surprise that it is fortified and perfect for any battle. However, if you consider the location of the castle, then it does seem strange that it was designed to protect a coast that it is quite far away from. Not only was the castle made to protect, but it was also designed to look great too. Particularly if you look at the surrounding landscape. Much like some of the other aspects of the castle, it seems that some of the exterior isn’t quite as grand as it once was, however, enough remains that you can still get a great idea of how it would have once looked. It also features a number of prime examples of architecture from the 14th Century, with a twin towered gatehouse entrance and plenty of towers creating a beautiful skyline for anyone who visits. Whilst Bodiam Castle is still a fascinating example of a medieval castle, it doesn’t hold quite the same impact as it once did. Unfortunately, this is because the interior of the castle has fallen into ruin. Thankfully, those who are interested in the basic structure of the castle will find that the basic dimensions of the castle, in particular functional rooms such as the cellar and kitchen can still be identified. So much so, that you can even create a floor plan of the layout of the castle, just using the remains to figure out how it would have once looked. Not only this, but there is also a grand hall, a chapel and an antechamber, as well as the accommodation for the family that called Bodiam Castle their home. This meant that the castle was split into areas that were solely for the family and their high status visitors, as well as some areas that were for the use of the staff and the servants. Rooms that would have been found within the castle include a Chapel, Household Apartments, Pantry, Kitchen, Lord’s Hall, Buttery, Chamber, North-West Tower (including a prison). There would have also have been a Great Hall, which would have been the social hub of the castle, where the Lord would have entertained his guests. The National Trust has taken on some restoration work on the ruins, adding new roofs to the towers and the gatehouse. During 1970, the moat was drained during excavations. 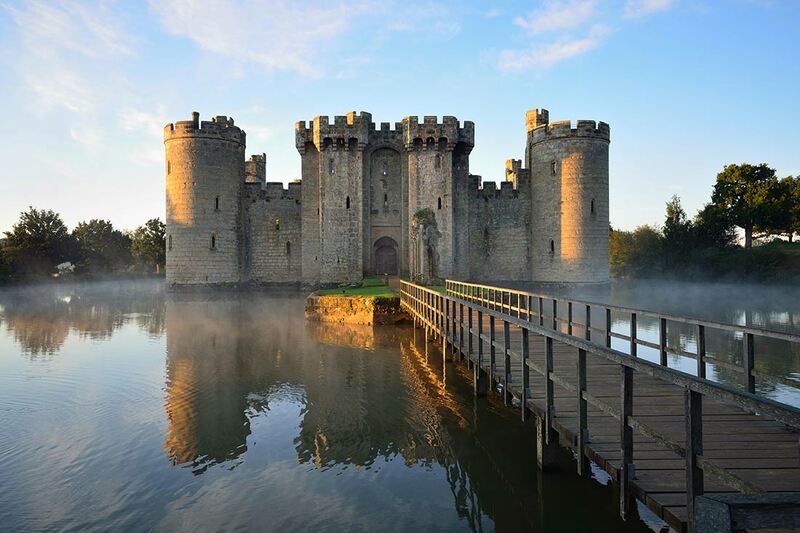 A beautiful place to visit and relive your childhood memories of knights in shining armour, Bodiam Castle is more than just some fascinating ruins, it also is packed with amazing and educational events too. Whether it is getting a glimpse into the past, or learning about the present castle and the wildlife that calls it their home, this is definitely a place to head to. Not only this, but the style and well maintained exterior of the castle was chosen as the Swap Castle for the Monty Python and the Holy Grail, just showcasing how beautiful the castle is, despite its age. Bodiam Castle run by the National Trust is open throughout the year excluding Christmas. It opens at 10:30 and closes at dusk. It features a castle, the grounds, a well-stocked shop and a tea room, ideal for a day out. So, if you are in the East Sussex area and you think it is about time that you took in some truly English heritage and history, then maybe it is time to visit Bodiam Castle. Not only is it set within a beautiful rural backdrop, but it is also ideal for those that can appreciate fine architecture, capturing the perfect example of a castle, as well as Great British 14th Century design and workmanship!